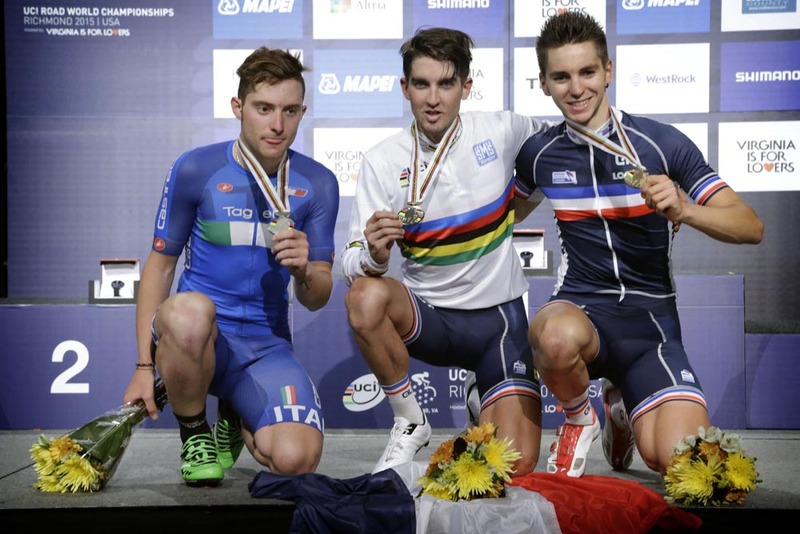 Kevin Ledanois (France) took the victory in the under-23 men’s road race at the 2015 UCI Road World Championships in Richmond, USA, on Friday. Ledanois put in a late solo move to net the world title, with Simone Consonni (Italy) in second and Anthony Turgis (France) in third. New Sky recruit Gianni Moscon (Italy) placed fourth. British hope Owain Doull was one of those caught up by riders falling off on the final cobbled climbs and finished the race in 93rd place, four minutes and 40 seconds down on Ledanois. The early stages of the 10 lap, 162.2km race were led by a five-rider break: Eddie Dunbar (Ireland), Jose Luis Rodriguez (Chile), Oleg Zemlyakov (Kazakhstan), Maximilian Schachmann (Germany) and Davide Martinelli (Italy). Dunbar was dropped on the ascent of the sharp cobbled climb of Libby Hill, then Martinez also dropped out of the lead group with a mechanical, leaving a trio of Rodriguez, Zemlyakov and Schachmann. With 25km to go, the leaders’ advantage dropped to only 25 seconds. A mix of teams led the pace of the chasing peloton, including Belgium and Great Britain – and then Italy when Martinelli was caught. The break’s time out front came to an end as they were caught on the penultimate ascent of Libby Hill. After the hill, the pace of the race accelerated and the peloton strung out. Soren Kragg Andersen (Denmark) put in an attack up and over the 12 per cent ramp of 23rd Street and impressively went clear into the final lap. However, his effort was fruitless as he was caught when Austria hit the front of the bunch and the rain started to fall. Several riders fell on the final climb of Libby Hill as their wheels lost traction on the slippery cobbles, resulting in the bunch being split to pieces. Ledanois capitalised on the chaos, going solo in the final two kilometres. Despite a concerted chase by Italian riders behind, he held out up the final climb of Governor Street to take the victory – but had to cut his celebration short as his wheel started to slip over the line. The world-title-deciding action continues on Saturday (September 26) with the junior men’s and elite women’s road races. The elite men’s road race brings the 2015 UCI Road World Championships to a close on Sunday (September 27).